Every November, podcasters and those interested in trying out the medium of podcasting create and post a podcast everyday for 30 Days. 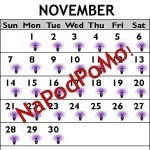 It’s National Podcast Post Moth, or NaPodPoMo for short. This isn’t a new idea and is done in the spirit of NaNoWriMo (novel writing), NaVlogPoMo (video blog), NaBloPoMo (blog posts). But why does the fun have to only happen in November? Every day starts another 30 days. Introducing the 30 Day Podcast Experiment. At any time during the year you can start your own podcast experiment and try podcasting for 30 days.